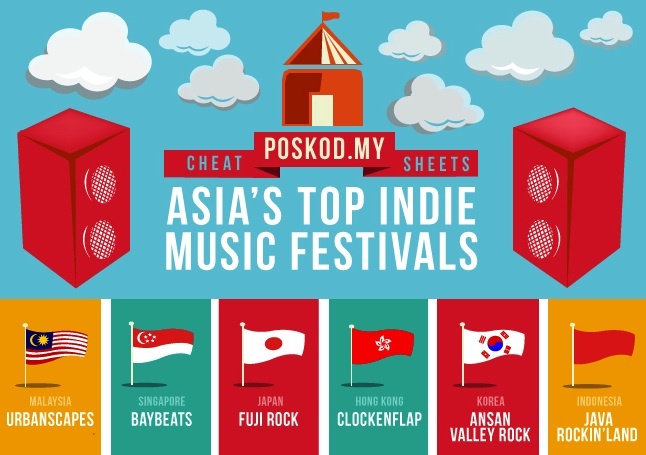 Asia’s Top Indie Music Festivals. Infographic by Kimberly Mak. Click to enlarge. 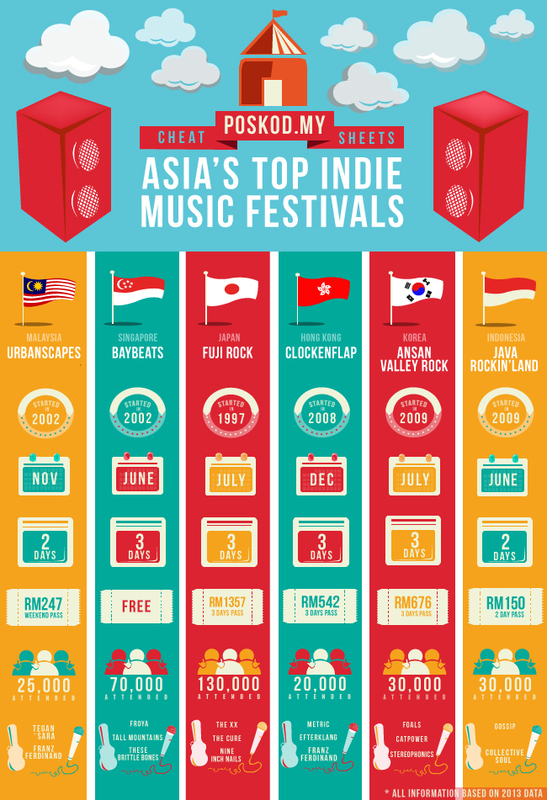 What’s the biggest indie festival in Asia? Fuji Rock Festival in Japan, which draws around 130,000 people each year. Which festival is the best value for money? Baybeats is great for someone who is interested in finding great musicians from around the Southeast Asia region. There’s so much talent spread out in three days and it’s free. If you’re a music fan who likes different genres, Fuji Rock is definitely worth the money. You’re paying RM1345 for a weekend, but you get to watch a variety of musicians and entertainers from every genre. Why aren’t Laneway and FMFA on your list? These festivals are more recent. We decided not to include them as they started as Australian festivals which have arrived in Asia in recent years. That’s not to knock them, though! Future Music Festival started in Sydney in 2006 and now draws around 50,000 people to all the major Australian cities as a one day festival. Future Music Festival Asia came to Sepang for the first time in 2012. Since then it has grown from a one day festival to what will be a three festival this year. 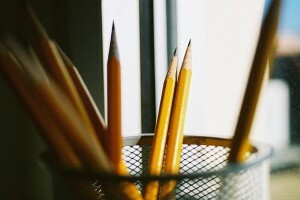 It now attracts around 55,000 people. St. Jerome’s Laneway Festival started in Melbourne in 2004 and also tours different Australian cities. Its first Asian edition was in 2011 in Singapore. This year, Laneway will return to Singapore for the fourth time. About 18,000 people are expected to come. Other popular Malaysian festivals include Rainforest Music Festival in Sarawak, known for world music; rock music festival Rock The World; and Penang Island Jazz Festival. Rainforest Music Festival (since 1997) hosts around 30,000 people a year. Rock The World (since 2000) has crowds of around 10,000. Penang Island Jazz Festival (since 2004) draws 7,000 people a year. How do Asian festivals compare to others around the world? Our audiences are still smaller compared to some of the world’s oldest and biggest festivals. Glastonbury (UK), started in 1970, sees about 175,000 people camping out for its three day festival. Coachella (US), started in 1999, draws about 85,000. 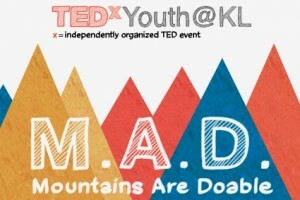 What’s the earliest known music festival in Malaysia? Quite possibly Rainforest Music Festival, which started in 1997. *Infographic based on 2013 data.